Land and resource conflicts in India have deep implications for the well-being of the country’s people, institutions, investments, and long-term development. These conflicts reveal deep structural flaws in the country’s social, agrarian, and institutional structures, including ambiguities in property rights regimes and institutions. In 2014, a study focusing primarily on reports in the national media reflected the gravity of these conflicts. 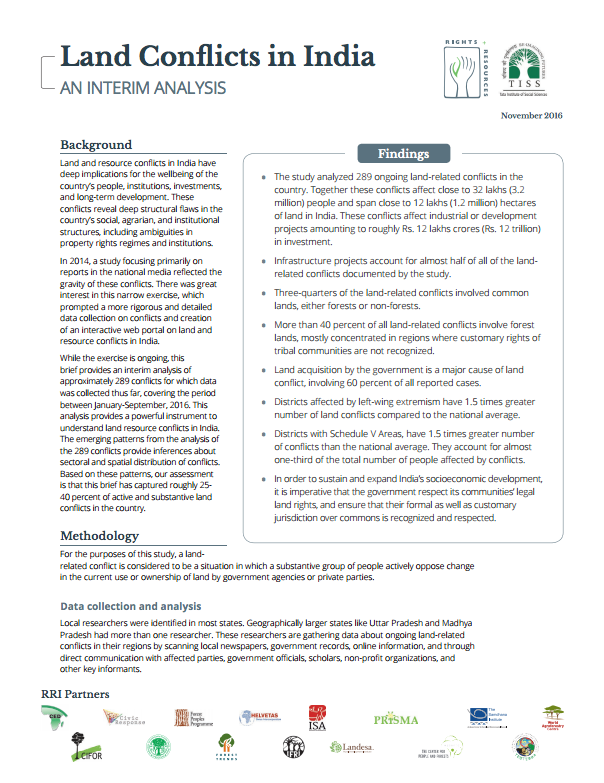 There was great interest in this narrow exercise, which prompted a more rigorous and detailed data collection on conflicts and creation of an interactive web portal on land and resource conflicts in India. While the exercise is ongoing, this brief provides an interim analysis of approximately 289 conflicts for which data was collected thus far, covering the period between January-September, 2016. This analysis provides a powerful instrument to understand land resource conflicts in India. The emerging patterns from the analysis of the 289 conflicts provide inferences about sectoral and spatial distribution of conflicts. Based on these patterns, our assessment is that this brief has captured roughly 25- 40 percent of active and substantive land conflicts in the country.